Before you toss that tattered and stained sofa to the curb, consider using couch slip covers to update its appearance. Much cheaper than re-upholstering your sofa and a fraction of the price of a new one, slip covers help you create a whole new look for your living room. Slip covers come in just as many styles as couches themselves. In fact, you can completely alter the look of the couch by covering it with new fabric. For example, if your couch was a freebie from a friend but it's a little too traditional for your tastes, cover it with a sleek, solid colored slip cover. Or perhaps your sofa is a dated bright orange, and you'd prefer a classic stripped pattern. Another reason to add a slip cover to your couch is to completely change the texture. Try lush suede, durable denim, or even faux leather. You might also choose to use a slip cover on a new couch to protect it from staining. It's also a great option if you enjoy variety; you can easily change slip covers out as often as you want. Since they are so affordable, buy a different one for every season! Many home furnishing retailers sell slip covers at affordable prices. Before you go shopping, you should carefully measure your sofa. Most slip covers are sized by the length of the sofa from arm to arm. Measure from the widest point. Check the store's return policy before you purchase and be sure to save your receipt. You won't know how the couch will look until the slip cover is in place, and you need to be able to return it if it's not a good fit. Just like clothing, slip covers aren't "one size fits all." You can purchase stretchy one piece slip covers, T-slip covers that accommodate the edge of the cushion if it overlaps the arm, as well as two-piece slip covers that cover the sofa and cushions separately. 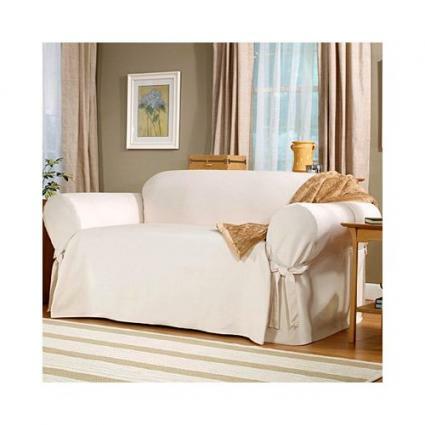 You may combine several seat cushions together in one slip cover, giving your couch a sleek, elongated look. Three piece covers include a separate cover for the back cushions. For difficult to fit couches try a furniture throw, which is draped over the couch and doesn't cling. If your sofa is oddly shaped or sized, you might consider ordering a custom made slip cover. They are slightly more expensive than standard sizes, but worth it to get the right fit. For those with excellent sewing skills, making your own slip cover is a more budget-friendly option. It can be intimidating to sew an entire slip cover yourself, so try the easier project of making couch cushion covers first. You should also consider embellishing a ready-made slip cover. For example, you can add piping, brads or beads. Decorative throw pillows are another way to personalize a slip cover. Choose patterned pillows for solid slip covers and vice versa.